Specialty: Developing CPU & GPU Processors for Personal, Business & Server computers. Became a fabless design company in 2009 with semiconductor manufacturing contracted to Global Foundries. Supplier of CPUs / GPUs for some models of Sony PlayStation & Microsoft Xbox video game consoles. AMD has been competing for CPU & Memory Chip market share against its largest rival, Intel, ever since the 1970's. Promotional items based on their products, especially ones that showcase samples of their various CPU, GPU and RAM chips, are quite hard to find and are currently highly collectible. From 1970 to 1974, logic chips were the only product that AMD manufactured. 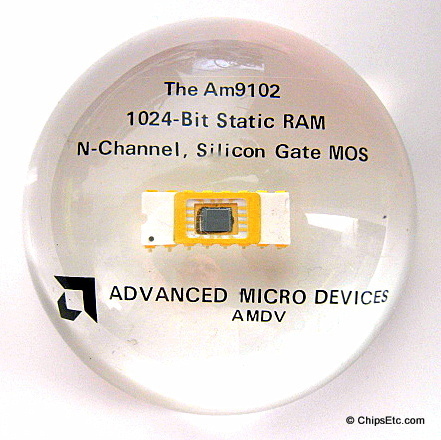 In 1975 AMD entered the memory chip market with their new AM9102 RAM chip. 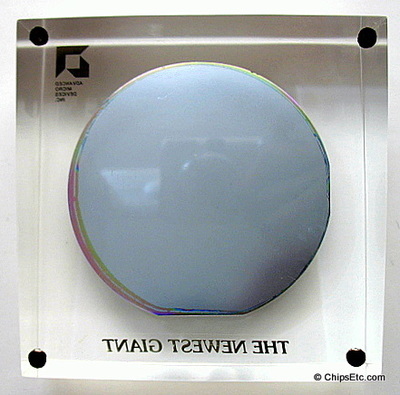 This Lucite paperweight contains AMD's first RAM chip - the AM9102 1k-bit (1024 x 1 bit) Static RAM chip. The NMOS manufactured AM9102 chip came in a 16-pin white ceramic & gold Dip package. This Lucite paperweight contains an early AMD 3.75" (95mm) silicon wafer containing RAM chips. The semiconductor industry transitioned from 3" to 4" wafers starting in 1976 which allowed for an increased number of chips per wafer. 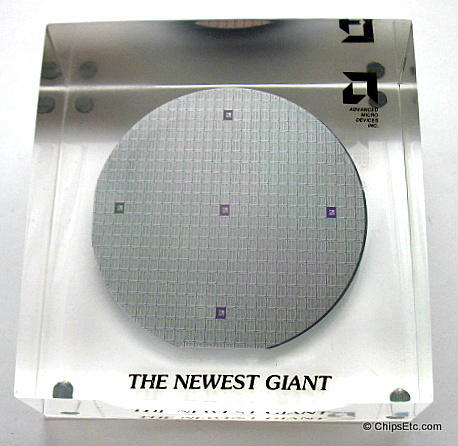 Reads "The Newest Giant", with AMD logo in upper corner. 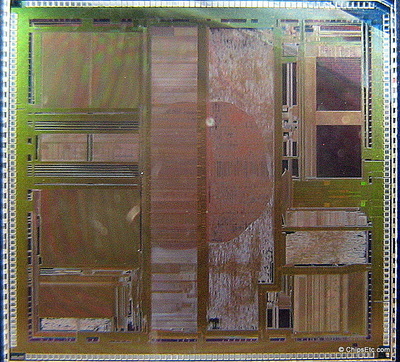 The AMD AM9140 chip contained 27,576 transistors and came in a 22-Pin ceramic & gold Dip package. 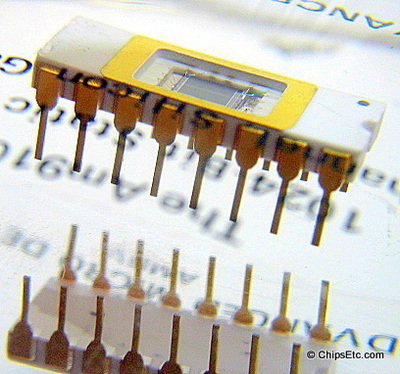 The lid on this sample chip is not attached, so the die and bonded gold wires are view-able. 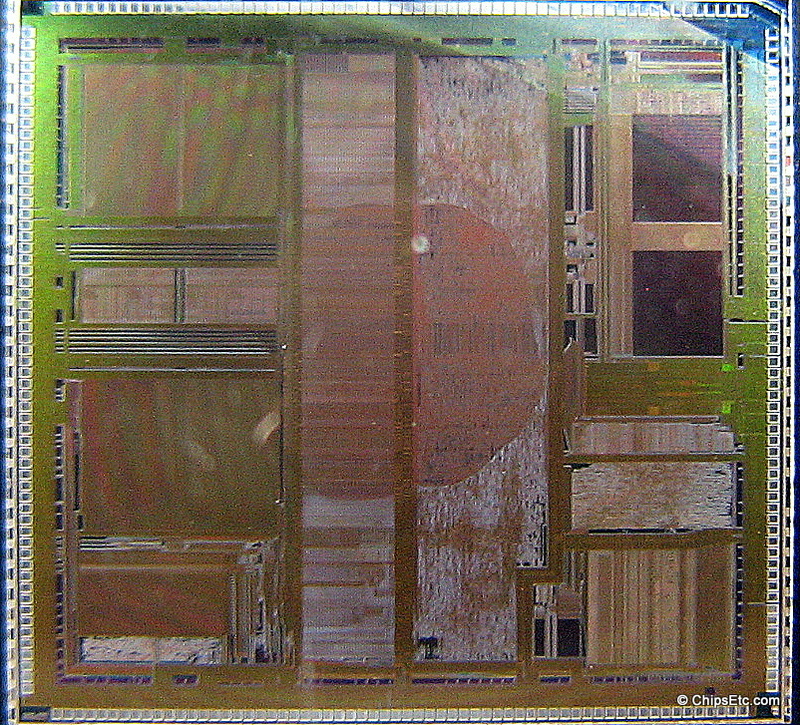 The AMD AM9140 was released along with the AM9130 4k SRAM (1024 x 4 bit). Together they composed the first 4k SRAM family in the industry. 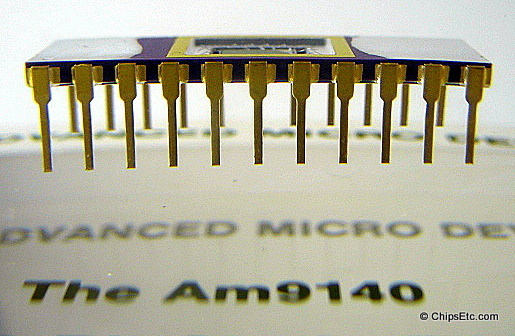 In 1977, Advanced Micro Devices licensed American Microsystems, Inc. to build its proprietary 4096-bit MaS static memory family. For an undisclosed sum, AMD provided detailed technical assistance for the design of the AM9130/9140 and related low-power versions. AMD also provided updated information as device improvements were made. These TTL compatible circuits required only +5 V and were organized lK x 4 and 4K x 1. The standard device offered speeds to 200 ns with maximum power dissipation of 550 mW, while the low-power version offers maximum power dissipation of 350 mW with speeds to 250 ns. 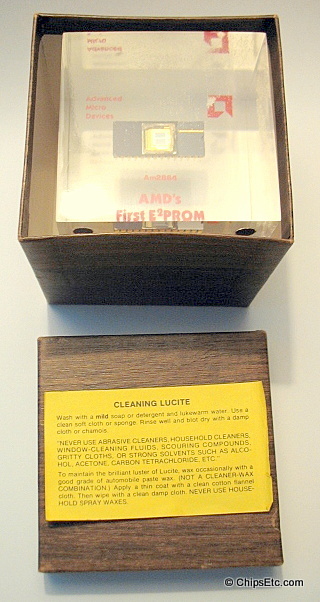 Lucite paperweight featuring AMD's first EEPROM (Electrically Erasable Programmable Read-only Memory) chip, the 5v 64k-bit AM2864. 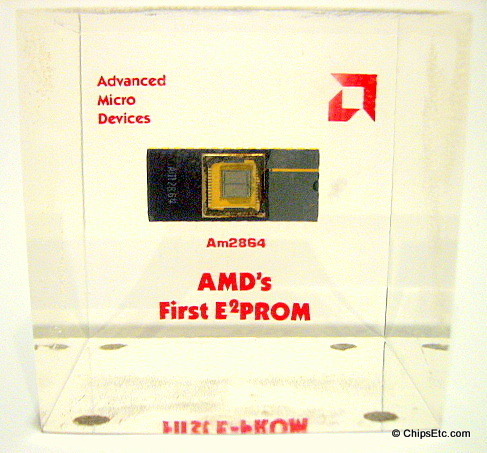 Paperweight reads "AMD's First E2PROM". 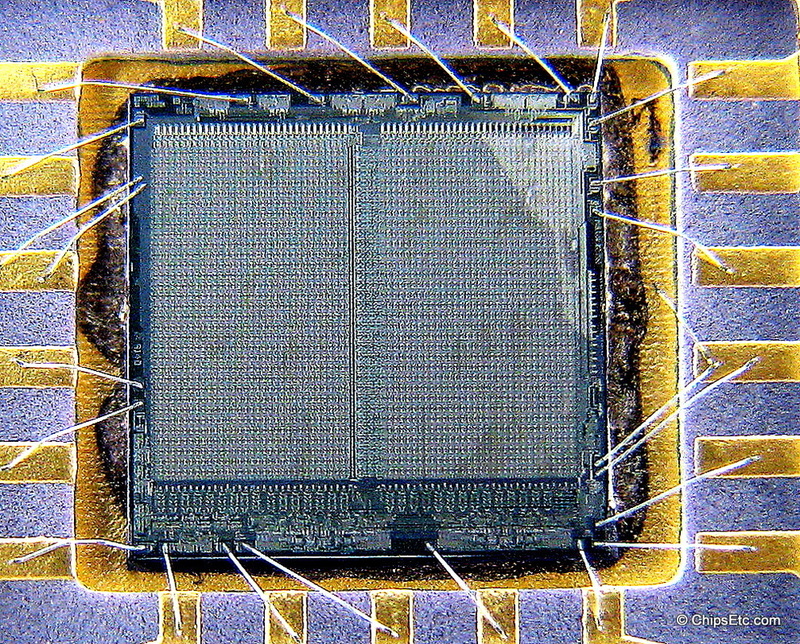 The AM2864 used MOS floating gate transistor arrays to form it's core memory cells. 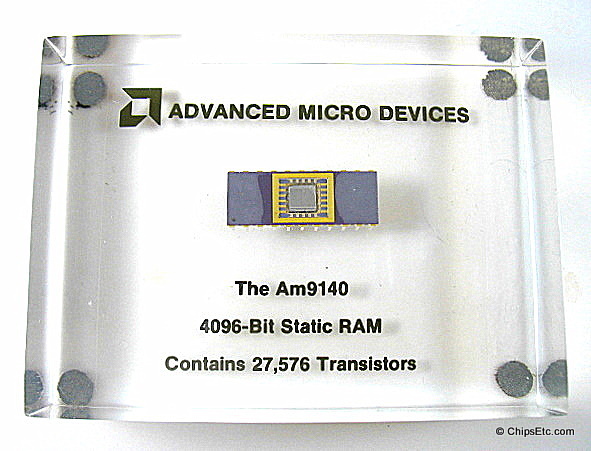 The first release of the AM2864 chip came in a 28-lead ceramic DIP package with gold frame & legs. The original gold lid has been removed allowing for viewing of the AM2864's MOS memory chip and gold wire bonding. 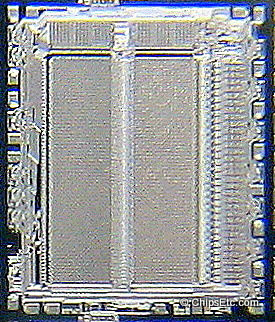 By 1988, standard EPROM memory would start to be replaced by the more advanced, and much faster, NOR Flash memory technology. Comes in original presentation box. 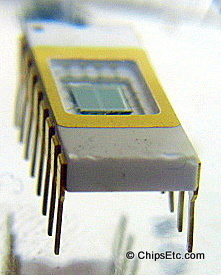 Intel introduced their new 130,000 transistor, 16-bit 80286 ("286") microprocessor in 1982. The Intel 286 microprocessor was designed to power IBM's new PC/AT line of desktop computers running OS/2, introduced later in 1984. The 286's original clock speed was 4 MHz, but would eventually increase to 25 MHz. In a licensing agreement with Intel - AMD, Intersil, Fujitsu & Harris Semiconductor were also given the right to manufacture the 80286 chip under a requirement from IBM that there had to be a second-source supplier of the chips. AMD would start manufacturing 80286 chips starting in 1985. By 1990, AMD had sold over 10 million of their 80286 microprocessors. 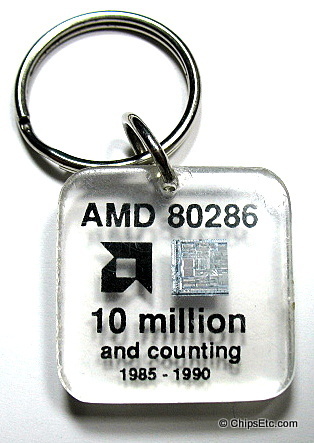 This Lucite keychain with an actual AMD 80286 chip was given to select AMD employees in recognition of that milestone. 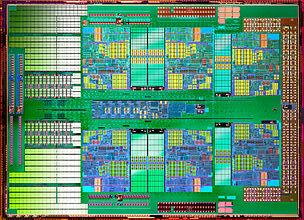 The 80286 would be the last microprocessor that Intel would license to be second-sourced by AMD. 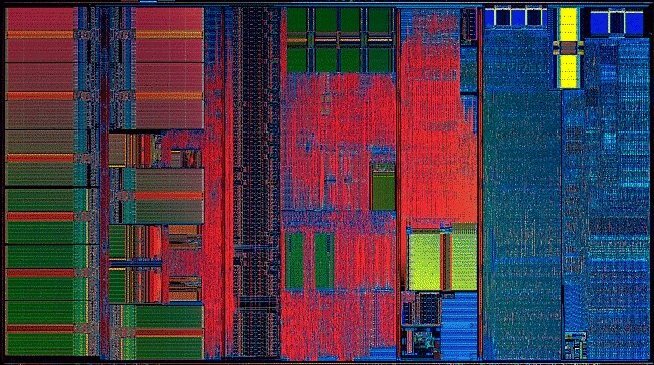 With Intel's decision to no longer share it's microprocessor design architecture, AMD would be forced to have to reverse-engineer Intel's next processor, the 32-bit Intel 386, when it was introduced in 1985. This greatly delayed AMD's ability to release a competing product on time. AMD engineers would work many hours on the 386 redesign (code-named project Longhorn), eventually releasing their own version of the 386, the AM386, almost 5 years later in 1991. 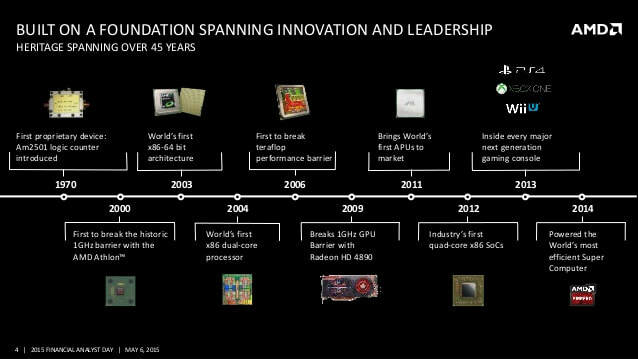 In 1996, AMD would release their first microprocessor to be completely designed "in-house", the 32-bit AMD "K5". 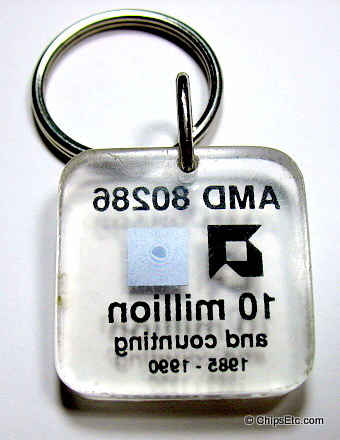 This Lucite keychain features an actual AMD 80286 Microprocessor chip embedded inside. The chip is a manufacturing defect (the die was mis-sawn thru the dicing operation). AMD celebrated it's 20th anniversary in 1989. This Metal and enamel pin was given out then to it's employees. AMD was incorporated in 1969, and went public three years later in 1972. Their first proprietary product was the Am2501 logic counter chip introduced in 1970. 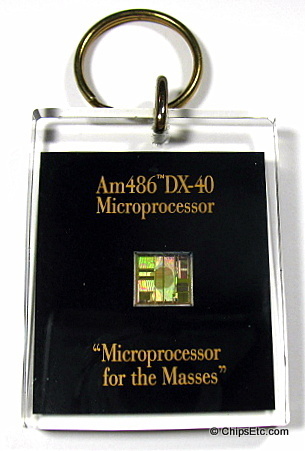 This is a Lucite AMD keychain promoting their Am486 DX-40 (40Mhz) version of the 32-bit 486 processor. The AMD Am486 was designed to compete with Intel's 486 and when released in April 1993 it offered Windows 3.1 (and the upcoming Windows 95 PC customers) a 20% better performance for the same pricing. Reads Am486 DX-40 Microprocessor "Microprocessor for the Masses" on the front, on the back it has the AMD logo. 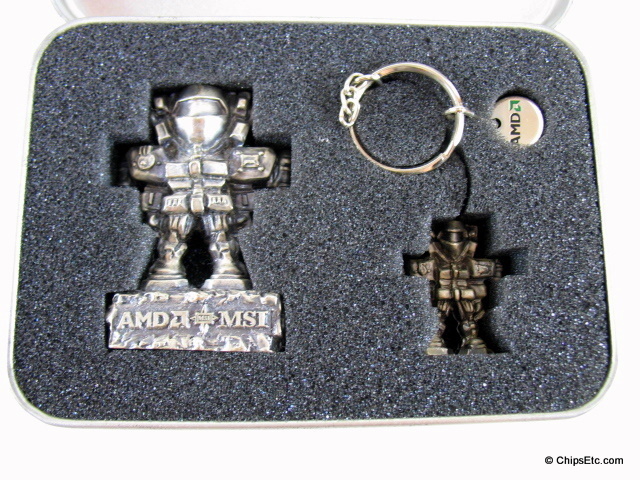 This rare AMD keychain was made available to AMD employees in 1996 and features an actual AMD K5 CPU chip. 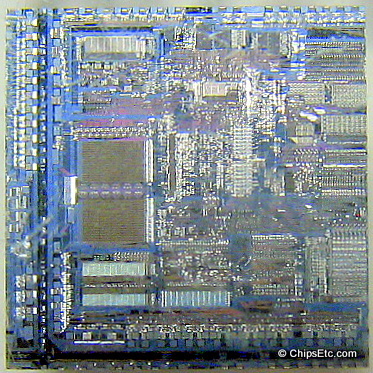 The AMD K5 CPU was introduced in 1996 at speeds of 75, 90 and 100 MHz. 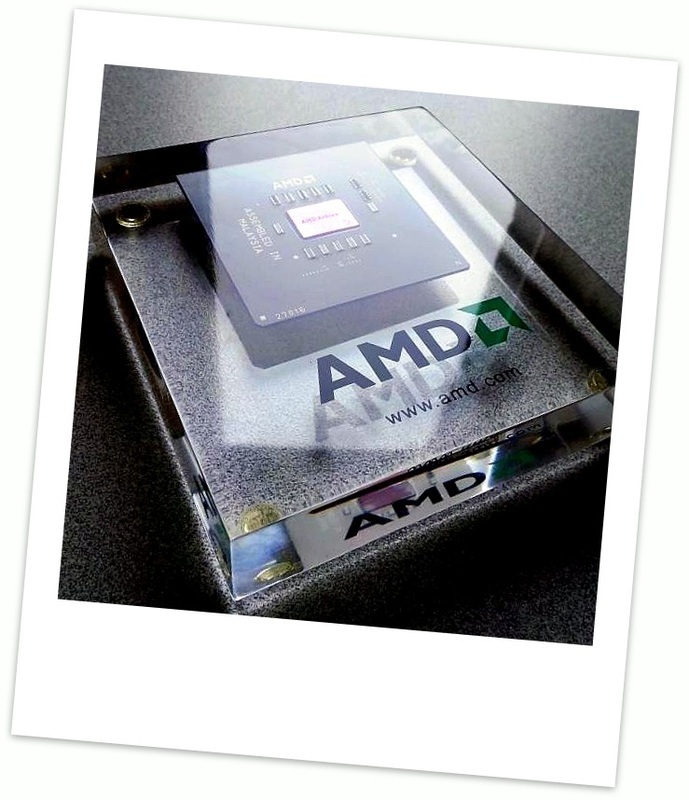 The K5 was AMD's first x86 superscalar CPU designed exclusively in-house. It was designed to compete with the Intel Pentium Processor and the Cyrix 6x86. Unfortunately, the AMD K5 lacked in speed performance and was never able to successfully compete with the Intel Pentium that was running at a much faster 166MHz in 1996. 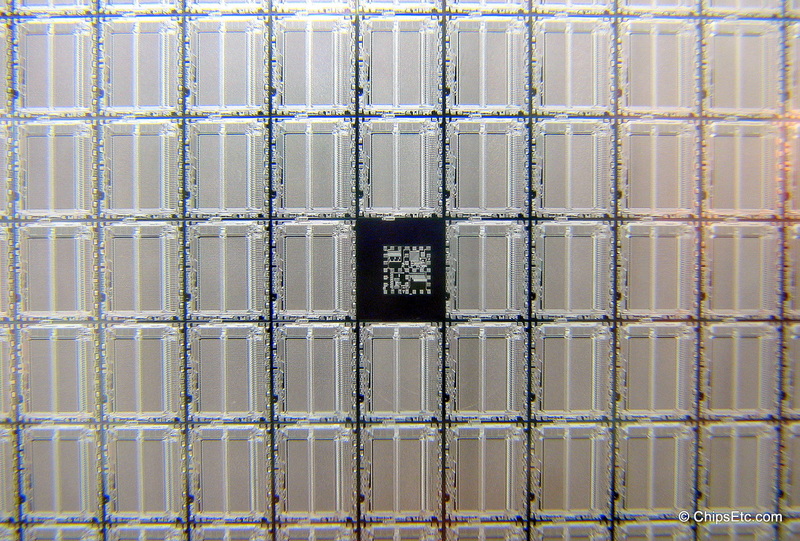 The K5 featured 4.3 million transistors and was manufactured first using 500nm technology, and a short time later moved into 350nm technology (0.35 micron 3-layer-metal CMOS fab process). 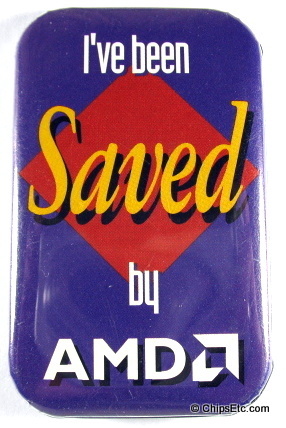 AMD promotional pin from the mid to late 1990s. 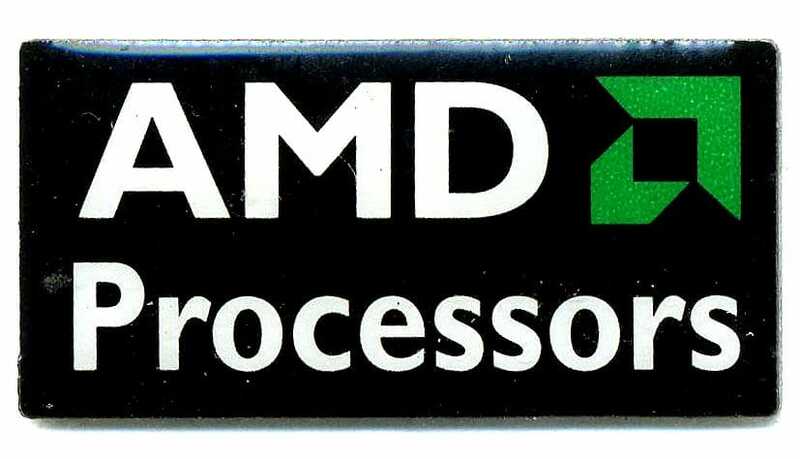 Reads "'AMD Processors" and has the green AMD logo. 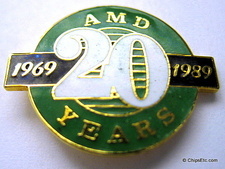 AMD promotional pin that was given away at the COMDEX computer trade show in 1995. 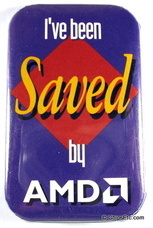 Reads "'I've been saved by AMD". Bill Gates' "Information At Your Fingertips" keynote speech was given at this COMDEX event in 1995, it became the basis for his book The Road Ahead. 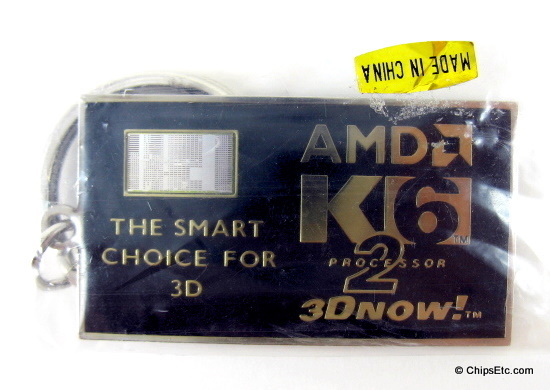 The AMD K6-2 was an x86 microprocessor introduced in 1998 at a speed of 266MHz, with speeds eventually reaching 550 MHz. The K6-2 was designed to compete with the Intel Pentium II processor. 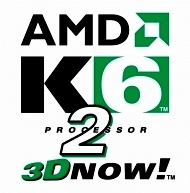 An enhancement of the original AMD K6, the K6-2 introduced AMD's 3D-Now! technology as an answer to Intel's MMX technology. The K6-2 processor was manufactured at AMD's Fab 25 wafer fab in Austin, Texas using a 0.25 micron five-layer-metal process technology using local interconnect and shallow trench isolation, and had 9.3 million transistors.. 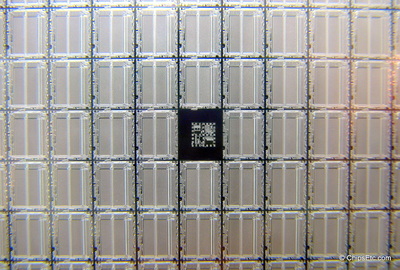 The AMD-K6-2 processor was available in a 321-ceramic pin grid array (CPGA) package using C4 flip-clip interconnection technology. The K6-2 was a huge financial success for AMD and it helped the company to generate income to develop its next very successful chip, the Athlon. This rare keychain contains an actual AMD K6-2 CPU encased in enamel. 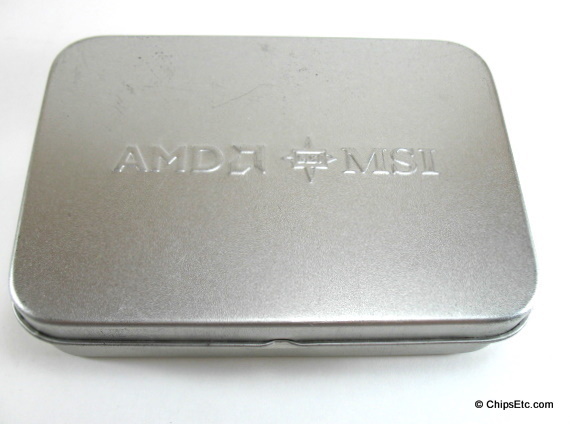 AMD released very few computer chip keychains throughout the years, especially compared to Intel, this item is quite rare and highly collectible. New , Unused in original sealed bag. 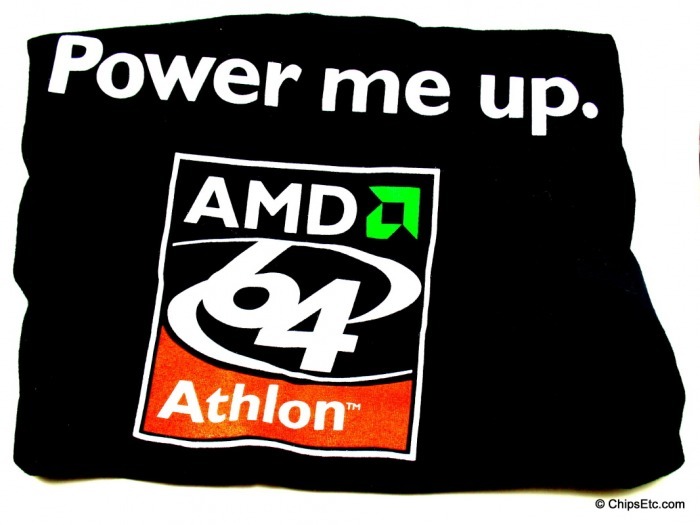 The Athlon 64 was the first Windows compatible 64-bit processor targeted for the consumer. It was AMD's primary consumer microprocessor, and competed primarily with Intel's Pentium 4. 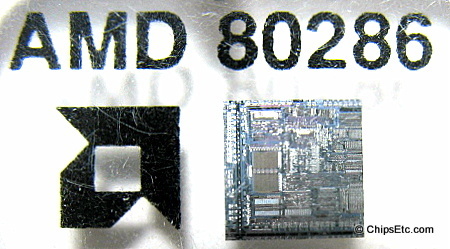 This chip was AMD's first K8 eighth-generation processor core for desktop and mobile computers. Black cotton AMD logo T-shirt. 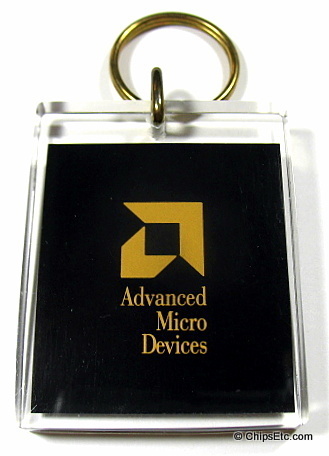 This Lucite keychain features a 45nm, 64-bit, AMD Opteron Hex-core (6 core) processor chip. 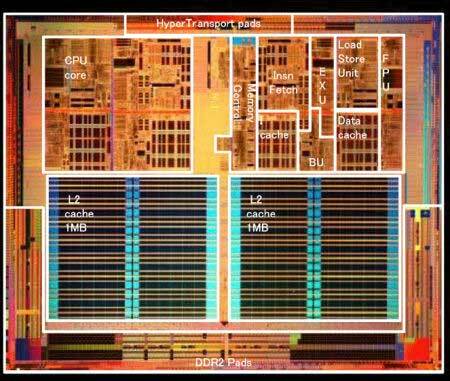 Code named Instanbul, this 2.6 GHz version of AMD's Opteron line of performance chips was designed for high-end Servers and workstations. It came with 6 MB of on-chip L3 Cache Memory. 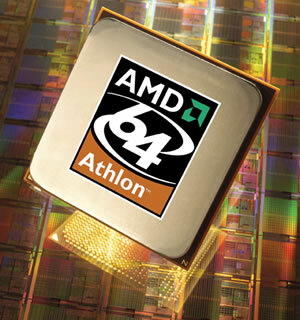 By 2011, AMD would be releasing Opteron chips with as many as 8, 12, & 16 processor cores. Keychain is new, unused, sealed in original package. 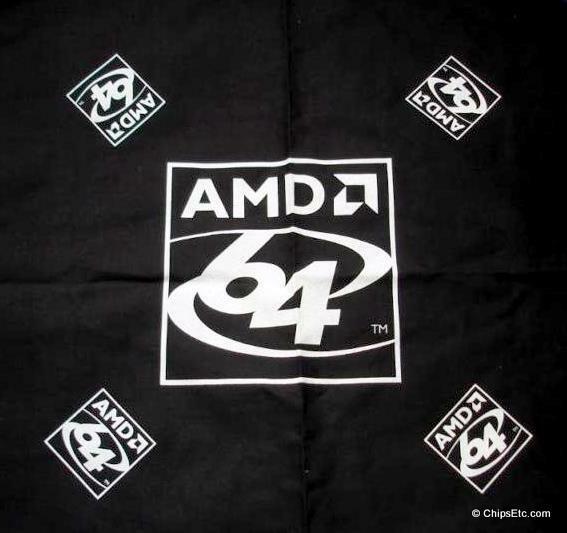 A 22" x 22" cloth bandana promoting the 64 bit AMD product lineup. 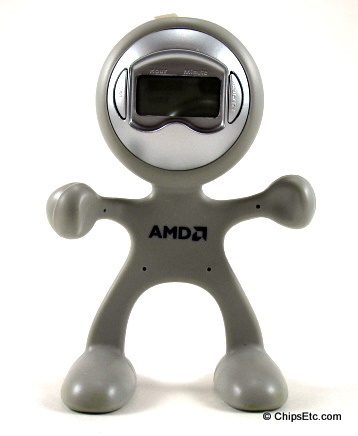 This limited release AMD Flex Man character clock is made of bendable rubber and has an LCD clock. Clock displays the Time (Minutes, Hours, Seconds), Day, Date And Alarm Function. Holds Notes And Business Cards. Has the AMD logo printed on the front. Measures 4 in. H X 3 in. W. New in original package, unused. A Silver Promotional Pen featuring the AMD logo. Comes with black storage slip case. A new deck of playing cards given away as a promotional item from AMD. 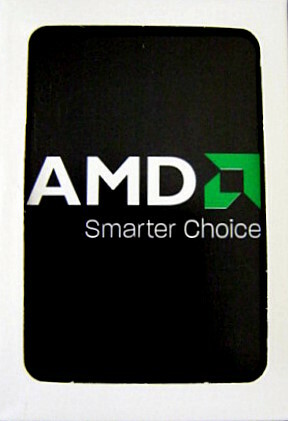 The cards are black and have the AMD green logo and "AMD Smarter Choice" on them. 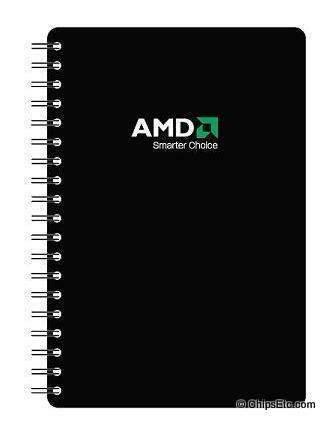 An 8 x 10" Black Spiral Notebook with AMD logo on the Cover. 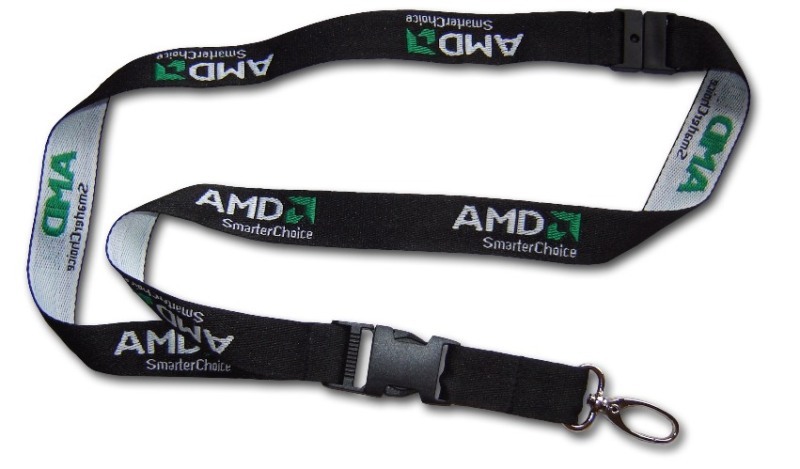 Official AMD logo Badge Lanyard as worn by AMD employees. This is a limited edition set of AMD / MSI (Microstar International) Video Game character collectible figurines. 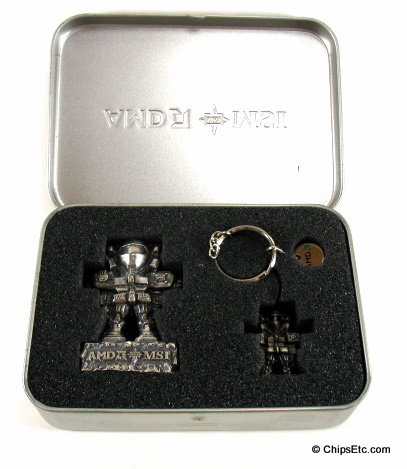 This set comes with two character pewter figurines; one is 2.5" tall, the other is 1.5" tall. 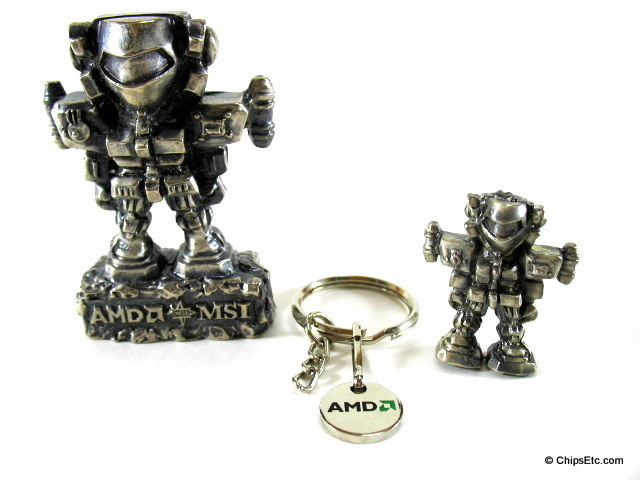 Set also includes an AMD keychain that reads "MSI - Link to the future" & has the AMD logo on the other side. 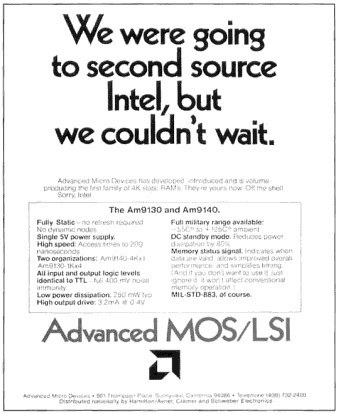 MSI created it's "link to the future" corporate slogan in 1999. MSI's product lineup throughout the years has included motherboards designed for gaming PC's, many models used AMD chipsets and they also supported AMD processors such as the AMD K-7 Athlon which was popular back in 2001. This set of character figurines comes in a stainless steel collectors tin with soft foam padding inside.